Aluminum awnings are very durable and they protect your home from the elements! 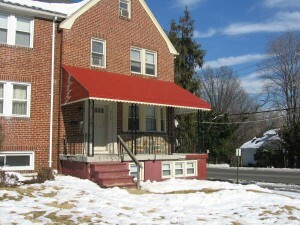 Awnings are a great way to improve the exterior of your home. They provide shade and comfort for the sunniest of days and protection from those rainy days. They allow you to entertain guests and enjoy the great outdoors despite what the weather forecast may be bringing. When it’s time to purchase an awning, you have a few options when it comes to what material to use. A lot of people only know about the fabric option, but aluminum awnings are a great choice as well. Here are five benefits of an aluminum awning for your home. Fabric can easily be torn or damaged when the bad weather hits. With an aluminum awning, you get a lot more durability. They are great at withstanding all the harsh elements that Mother Nature throws our way. They won’t warp or stretch when a little wind comes blowing in its direction. As long you keep up with simple maintenance, your aluminum awning can last more than fifty years. Awnings range in price depending on size, type, and material. In comparison to metal awnings which are probably the most similar to this material, an aluminum awning is less expensive. You also are getting the most for your money because of the fact that their lifespan is so long. Investing in an aluminum awning is a great, cost-effective way to protect many areas around your home including your doors, windows, and patio. At first thought, you may think an aluminum awning will actually look like the material its made of it, giving your home an inevitable rustic look. However, this is not at all the case. Aluminum awnings come in almost any color and design to match your home’s exterior as needed. They also have varieties that are more traditional as well as ones that have a modern look. No matter what design you are looking for, you can find the perfect one with an aluminum awning. After you install your awning, there isn’t much that is required after that to keep it in good shape. All you have to do is spray your awning down every so often with a hose to remove any dirt and debris that may have accumulated on it. There are times when you may want to do a deeper cleaning and manually wipe down the awning with some soap. However, most times, hosing it down will do the trick. You can end up saving some money in the long run with the use of an aluminum awning. They are great at absorbing the heat from the sun. If you have an aluminum door or window awning, it will work to keep the heat out, making your home naturally cooler. This makes it so that you don’t have to crank your air conditioning up as high on those hot days. Ready For Your New Awning? Call Carroll Awning Today!